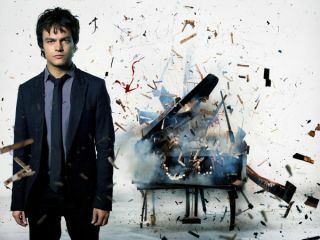 The above video is for Jamie Cullum's version of Rihanna's Don't Stop The Music from his new album The Pursuit. You'll notice - spliced between shots of the jazz maestro tinkering away - a Yamaha C3 piano is effortlessly exploding in slow motion. According to Yamaha's Download site, here's how it was done: "Yamaha had found a 'beyond repair' C3 for the project and also supplied hundreds of piano components including keys, hammers, shanks and string". "In all, four replica pianos were blown up, the shells of the pianos were fractured with an explosive cord resembling something out of a Bond film, charges were wired up, and cables ran to a detonation block. The button pushed, The cord shattered the replica cabinet, followed instantly with a whole series of secondary explosions precisely controlled to the millisecond to ensure the overall 'shape' of the explosion was correct." "All the internal workings of the piano were then catapulted through the fractured cabinet structure using an air mortar which created a ball of shrapnel moving through the air. Legs and keyboard were both on separate charges and the film was shot at 1000 frames per second, or 40 times slower than real time." You can see the video's 'money shot' put to grand use on The Pursuit's cover art below.